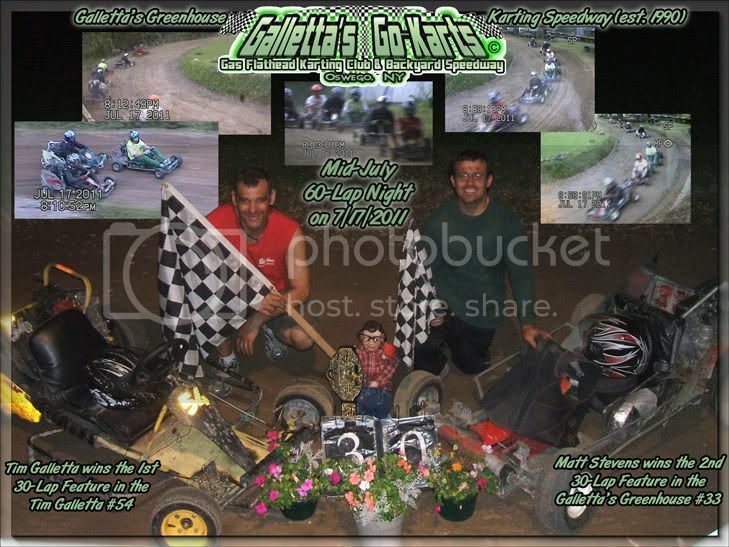 Galletta's Karting Club | July 17th, 2011 Race Results - Twin-30s | The only FREE racing club in Oswego!! Note: The 2nd video was accidentally processed in 16:9 widescreen, but both camera angles are both 4:3 standard screen. Sorry about that. Other than that, it still came out pretty nice. As usual, all of our YouTube videos are LOW-RESOLUTION, heavily edited and COMPRESSED highlghts from our weekly DVDs, which are of standard DVD quality and unedited. Also, all YouTube highlight reels are compiled on "Year In Review" DVDs at a rate of 1 or 2 volumes per year. Please ask me if you want a copy of any DVD in our library (just tell me the date and/or who won) for $3 each (in plastic baggie), $4 each (in paper disc sleeve), or $5 each (in plastic disc cover). 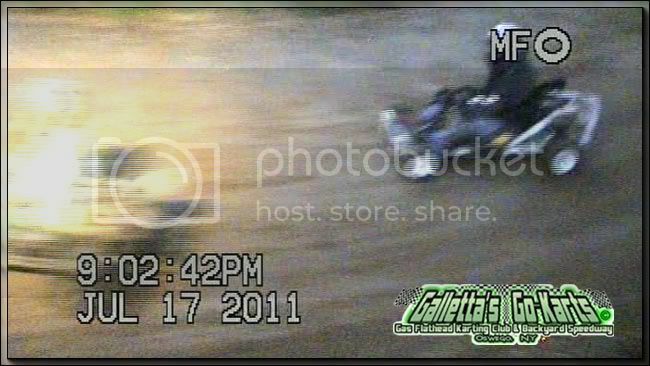 Early on in the show, Joe Sereno tried to get under his brother Justin Galletta and spun out. This would be the only caution of the night. Here Justin Galletta (#7) holds off his cousins-once-removed Matt (#33) and Chris Stevens (#8) while his dad Tim charges in the lead up ahead. 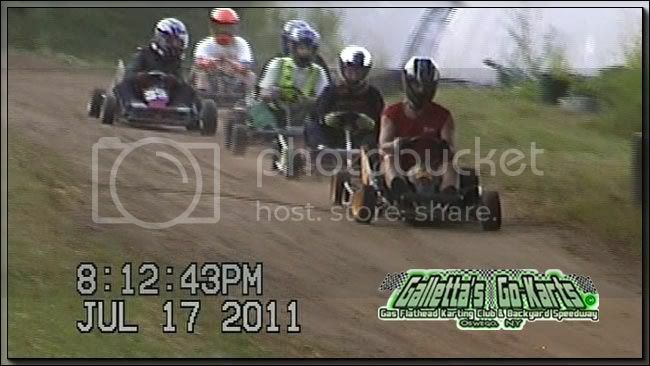 And as can be seen on the video, Timmy (#54) had a tow-in and yet was able to maintain the lead. Late in the race, Joe Sereno was able to recover from his early spin and get Matt back with a couple of laps to go. 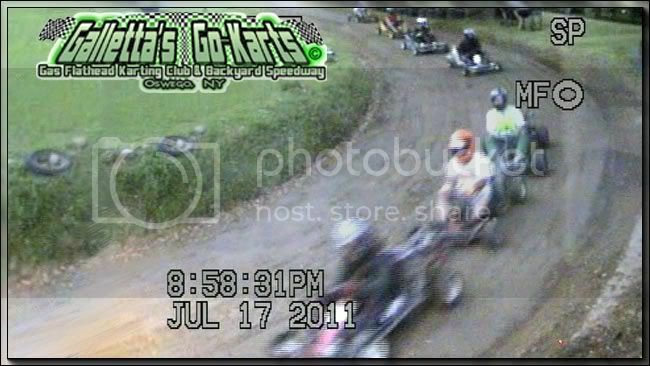 And on the last lap, Chris Stevens barely snipped Justin at the line for 3rd, after Justin had maintained the position for the first 29 laps! That's how close our racing is, folks. 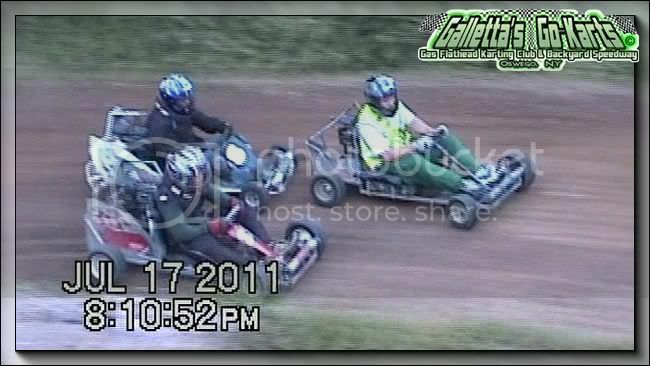 And clean, family-friendly racing at that! 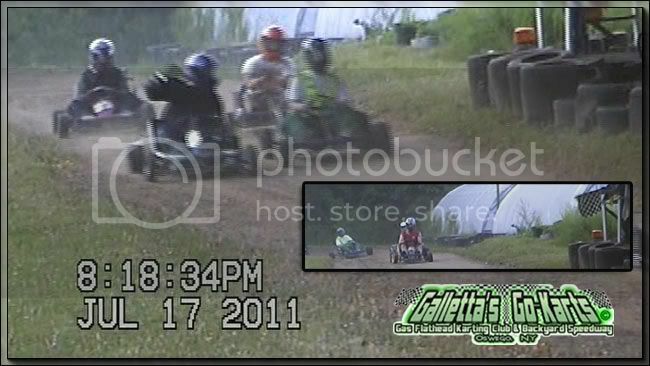 One of the original Galletta's Club karters made it out to get some laps in! Brian Galletta wasn't dressed, but he took the #9 out for a few laps at the start of the feature to get into the points and work into the handicap for maybe next race. Brian used to race with us all the time, was visiting points champ for many of our late-90s/early 2000s seasons and has won two features, and if his arm can handle it (arm surgery effected his ability to run weekly), he could be a weekly threat at picking up some wins. 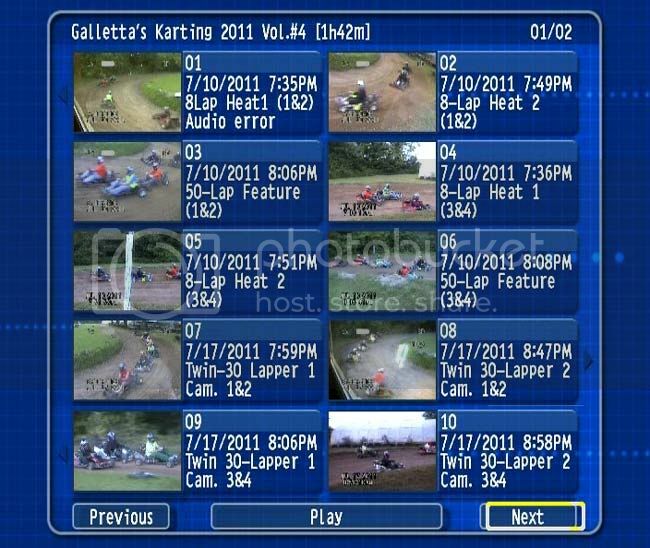 The 2nd feature, as usual with twin-feature races at Galletta's - started inverted from the finish of the 1st. But... OOPS... Matt came in last. Oh, f***! Next weekend's racing is going to be an experiment. We will be holding a Saturday race for rookies and drivers who have missed at least one race so far this year - a Rookie/Retcon race. Then, our standard race (which can also have rookies and retcons) will take place Sunday. With only six people to start the night, something's wrong. How, in the alleged race town of Oswego, NY - with all the buzz about the Steel Palace getting new owners and a facelift (odd... we went there weekly for the better part of the past three decades, why only now are people going back? 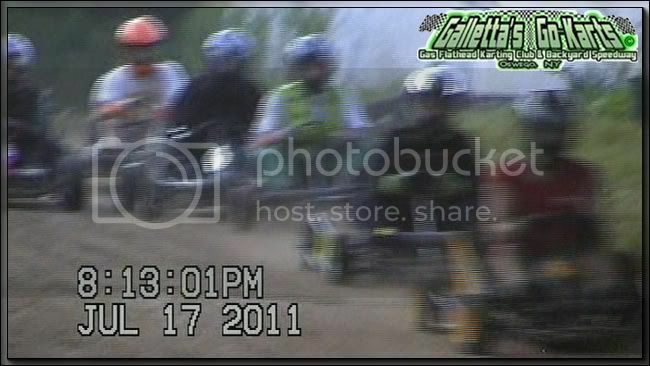 ), and many people who are then getting the race-bug and looking into karting - we can only get 6-8 people to show up to race? With several arrive-and-drive karts sitting idle? Any of which a veteran driver could hop in and win any given feature? With flexible rules that allow bigger people to race evenly with smaller people instead of splitting it into dozens of meaningless divisions by weight, motor and age? Really? Even when we purposefully schedule around local tracks in order to try and squeeze a few local race-lovers in? Really? There are people out there, likely reading this, who know one reason why. But former friends with childish and warrant-less vendettas who become disgruntled, gossipy back-stabbers aren't the only issue. Holding Sunday races to get a few Oswego fans out (that don't care to stop by), is getting nowhere, because people out of town have work the next day and can't make it. So, now we are going to attempt some Saturday races in order to get some people from outside of Oswego to race, because it appears that too many local race fans are looking lustily at a converted parking lot as a dreamy stepping stone to the Steel Palace -- and getting utterly fleeced for five minute races-- instead of looking at evenings of good, clean, affordable racing with good drivers and equal equipment.